The Happiest Millionaire was a big budget live action musical flop that struggled to get released, not playing to general audiences until the end of 1967. However it was Walt's belief that Leslie Ann Warren and John Davidson were the next big onscreen couple, so before his death he had found another project for them.. It would be their last film together. Originally intended as a two-part TV special, the studio developed the autobiography of Laura Bower Van Nuys called The Family Band into the much longer titled film, The One and Only, Genuine, Original Family Band. The book was adapted by Lowell S. Hawley and was his final screenplay (other works include Swiss Family Robinson and Babes in Toyland). TV director Michael O'Herlihy directs his only Disney film. Walter Brennan makes his final Disney appearance as Granda Bower. Disney Legend Buddy Ebson also returns to the studio for the last time. Kurt Russell (Follow Me, Boys!) has a small roll in this film, shortly before his rise to fame at Disney. One of the children, John Walmsley, was also the voice of Christopher Robin in the short Winnie the Pooh and the Blustery Day. 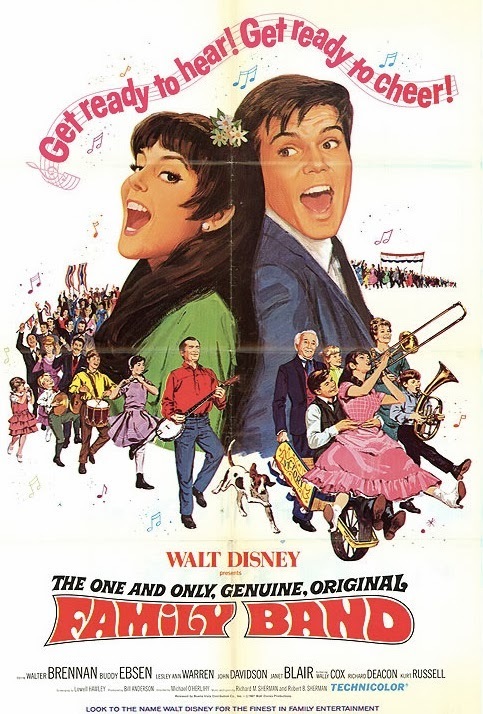 The Sherman Brothers wrote ten original songs for the film, eight of which made it into the film. The film begins in 1888 with the Bower family rehearsing a song in their barn. A man arrives from the Democratic National Committee to ask Grandpa Bower to have the family perform their campaign song at the St. Louis Convention. They give him a demonstration performance and get an invitation to perform at the reelection campaign for Grover Cleveland. While the family is dancing and celebrating, the man the eldest daughter Alice has been writing to arrives and she gets embarrassed, but he finds it charming. He's in town to find fellow Republicans to move to the Black Hills of Dakota, which causes a fight with Democratic grandfather. The family decides to move, with Alice becoming the town's school teacher. After the family sings their Grover Cleveland song in public, the family becomes outcasts and school is canceled on Alice's first day. Joe sings to her about his love for her to cheer her up. Meanwhile grandpa went to tell the kids to go home but unintentionally gave the kids a history lesson. This causes a bigger fight in the family and grandpa decides to leave. Shortly after, grandpa returns to find that the family hasn't been practicing for their big performance. They beg him to come back and lead them. When Cleveland loses to Benjamin Harrison, the whole town is reunited when Cleveland announces he will make the Dakota's states before he leaves office. The film ends with closing credits as the town celebrates with a parade. The One and Only, Genuine, Original Family Band premiered on March 21st, 1968 at Radio City Music Hall in New York City. Like Millionaire before it, it was a critical and commercial failure. It made it's TV debut in 1972 and the title was shortened to just The Family Band. It was one of the first Disney films released for video rental in 1981 and was released for sale in 1985. I really enjoyed The Happiest Millionaire, but find Family Band to be a fairly weak follow up. It has a few highlight moments, mostly when the Sherman songs liven things up. I tend to really enjoy films set in the Victorian era with a slow pace, but this film is a little bit too slow. When the decision was made to make it a feature film instead of a two-part TV special, the Sherman Brothers were resistant because they didn't feel the story was strong enough to warrant more songs or a theatrical release. Two songs were cut from the film and Richard Sherman claims the original runtime was 156 minutes (the only version ever released is 110 minutes long). Goldie Hawn, Kurt Russel's life partner, makes her feature film debut as a dancer in this film. It was their first meeting, but sparks didn't fly between the two until more than a decade later. The One and Only, Genuine, Original Family Band is currently available on DVD, where it is presented in pan & scan fullscreen. The original theatrical release was widescreen 1.75:1. This presentation has some excess grain and artifacts. The DVD release surprisingly has bonus features, which include an audio commentary and a retrospective featurette with the cast. A newer restoration was done and is available on iTunes in widescreen and HD, but without any bonus features.